The quality of our products is unparalleled; our collections of dance, praise and gym wear are constructed using only the softest fabrics, richest colors and strongest materials. Careful attention to detail goes into each and every one of our garments, from the double surged seams and quick dry linings to the distinctive fashion designs. Whether you are just now discovering Eurotard Dancewear or have been a loyal customer for years, we thank you for your interest and continued support. #06121c - Mini ballet skirt with a subtle high-low cut from front to back and a flat waistband. #61752 - Classy scoop neck half back design with black satin on black mesh accents. 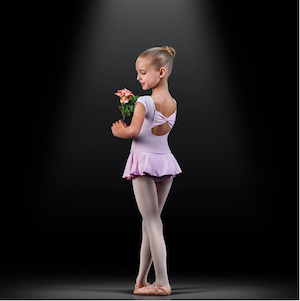 #44527m - The perfect little leotard for any class; the classic cut is both flattering and comfortable. A pinch in the front adds the right amount of style, and the V in the back makes it easy for teachers to see your alignment. The microfiber wicks away moisture, and the Hydro-Dry / Ultra-Fresh lining keeps you feeling fresh. #44285 - A trendy bow back, a precious cap sleeve, and an attached skirt…what more could a tiny ballerina ask for? The microfiber is supple, wrapping dancers in soft comfort. This piece is basic enough to fit within most studio dress codes, and fashionable enough to draw the attention of dancers. #210 - Euroskins® Non-Run Tights are constructed with touchably soft, seamless microfiber and features an ultra comfortable knit waistband that gently hugs your waist. The design of these tights lays so smoothly and comfortably that it almost feels like you are not wearing tights at all. The convertible foot opening is reinforced for extended wear.